When I shared the news about our potential puppy with my family, there was no hesitation from my kids -- "Let's go see her!" they cried. My husband hesitated, "Another dog?" Then he peered at the photo of her flashed on my screen: "She's awfully cute." 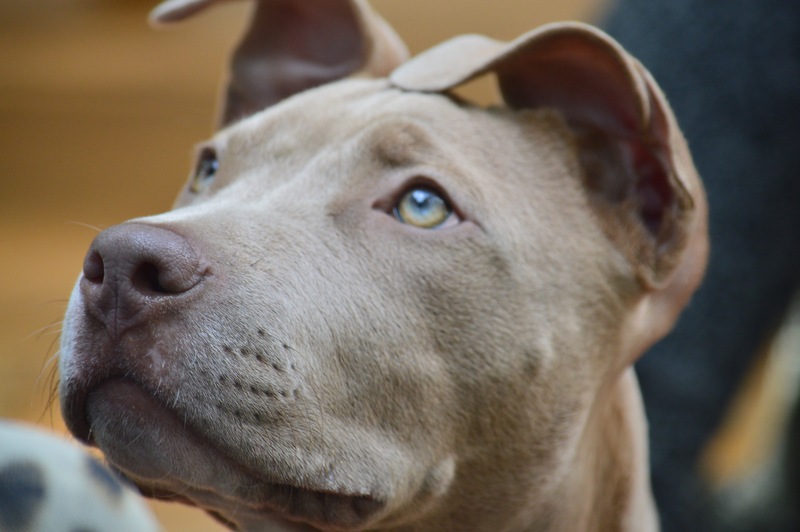 Why a renowned trainer, author and Huffington Post blogger chose a pit bull puppy for her family. Recently, my family and I went to Puttin' on the Dog, an adoption event held by the Adopt-a-Dog foundation in Greenwich, Connecticut. The sun was shining, my kids weren't arguing, and I swore to my husband that we wouldn't leave with any more paws than we arrived with. Nothing could stop me from looking, though, and what I saw from the entrance gate made my heart skip a beat: a little cappuccino-colored pit bull type puppy wearing a big orange "Adopt Me" vest. I bit my lip. Everywhere I turned, I saw her--a rescue named Khaleesi--surrounded by children, playing with other dogs or napping, belly-up, in her handler's lap. I couldn't resist; when my family was off getting ice cream, I tiptoed to the adoption tent and submitted an application. I'm sure some will wonder why a suburban mom, respected trainer, author and applied animal behaviorist mindfully desired a pit bull rescue from unknown origins to raise with her kids. With insurance companies openly banning bully breeds and entire nations put on red alert, why would anyone choose a pit bull type dog as a family member? Well, because bully breeds make great family pets. They're trustworthy with children, except when they're not--but that goes for any breed of dog really. Labrador retrievers, Collies, Spaniels, St. Bernards, and Chow Chows are also known biters. Aggression is not a breed-specific problem. It's not species-specific either. Consider people: 2,000 American children are killed each year by their parents. Guns claim more than 11 thousand lives annually. Dogs--as a species--are responsible for 42 deaths each year. It's hard to know where to point the finger. Less than a century ago bully breeds were celebrated as England's Nanny Dogs for protecting the children of aristocrats and wealthy landowners. In the States, Bully breeds were once patriotic symbols. Thomas Jefferson's two bully type dogs were the first to call the White House home. Bully breeds have been renown for their loyalty, but while their life-saving feats continue to this day, their bravery no longer attracts the attention it once did. Instead, headliners seize every opportunity to cultivate fear of these dogs. So what turned "pit bull" into a four-letter word? The term "pit bull" doesn't even represent a real breed. Many people lump any large, statuesque dog under this stereotyped label. Historically, bully breeds were created from the English bulldog, a breed used primarily by butchers to control livestock, and later in the sport of bull baiting. When so-called sportsmen needed a dog stubborn and strong enough to fight more ferocious animals like bears, they mated bulldogs with agile terriers. Victorious dogs lived to pass on their genes, and in time, the sportsmen got what they were after: a true fighting machine. Notable, however, was the ritual of culling (a fancy term for killing) any dog who showed aggression towards people. While the bull baiters wanted their dogs to fight wild animals and large game, a dog who would turn on his owner or lunge at a referee was dangerous indeed! When bull baiting was outlawed in 1835, enthusiasts decided it was safer to pit dogs against one another. Dog fighting, although illegal, continues to attract a worldwide following. Human-focused aggression didn't make it into the gene pool until the mid-1980s when both drug lords and law enforcement officials took advantage of the bully breed's stature and trainability to use them for personal protection. Before this time there were virtually no serious accounts of bull breed related attacks on humans. Today, bull breed dogs are favored by young males between the ages of 18-25; the demographic who are most unlikely to neuter their pets or condition their dogs to family life. This statistic coincides with records that show that the majority of dogs involved in critical attacks are unneutered. So why did I want to add a pit bull type to my family? Because they're calm, they adore children, and they're sensitive to all family members. If conditioned as puppies, bully breeds are no more difficult to socialize to a multi-species house than any other sporty, motion-driven dog. Sure bully breeds are strong - they need exercise and heavy doses of love and affection. We have that in spades. Yes, they have big mouths and wide jaws but so do a lot of dogs. The urban myth that pit bull types have a third jaw capable of locking into place is just that--a myth. When I shared the news about our potential puppy with my family, there was no hesitation from my kids - "Let's go see her!" they cried. My husband hesitated, "Another dog?" Then he peered at the photo of her flashed on my screen: "She's awfully cute." The rest, as they say, will fade into history. After some handling to ensure Khaleesi, renamed Mojo, would not growl over bones and would be comfortable with routine handling and kids' play, we signed all the necessary papers, handed off a donation check and went on our way. You can follow Mojo's story on my Facebook page. If you'd like to bring a little bully-love into your life, search for a reputable breeder or rescue organization that performs temperament tests and teaches their dogs a few manners before placing them. Once you bring your dog home, socialize and train your dog/puppy with children and other animals. Meanwhile, get the word out. Stereotyping anything--breed or race--isn't fair. It's the people who mindfully exploit these otherwise sweet-natured and fiercely devoted dogs who need to be shamed. As Larry Hill, a Southern California bull breed advocate and trainer states: "This animal is not a detriment to society; Society is a detriment to this animal."